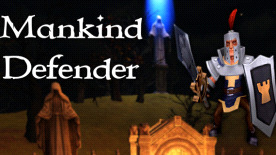 Mankind Defender is a hack'n'slash with many diverse battlearenas and statistics upgrades system set in a fantasy world. Gameplay is typical for H'n'S games . During the game you earn gold, which you can spend on learning new skills or improve your statistics and passive powers. You have several skills and battle stances at your disposal. At the end of each arena you have a chance to test your abilities in a battle with the boss. You are the chosen one who must confront countless bloodthirsty monsters. Horde of enemies threatens humanity, and you, as a champion, decided to prevent the evil. You have to move to different places in the world to kill all the beasts. You travel across the deepest caves, the highest peaks, the most terrible cemeteries and even reach into the depths of hell. The goal is one - to stop the one who brought evil on Earth.Improve both your equipment and your statistics to be able to survive in a battlerage.So Adventurer! Take your sword 'n' shield and show what you can do!